Slim has led a life in which motor racing and music have been inextricably linked. He first started watching motor racing in 1959 and the sight of Sterling Moss at the Karlskoga circuit in Sweden left a deep and lasting impression on him. Around the same time he started playing music and then, aged just 16, he joined the Merchant Navy. The nickname “Slim” was acquired when playing an impromptu gig at a club during a stopover in New Orleans; only he can tell the story! In 1965 he joined and played drums for a popular "blues" outfit, the Lea Riders Group, and in 1968 went on to form a new group, named Made in Sweden, together with two other highly respected Scandinavian musicians. It was also in 1968 that Slim’s racing career really started taking shape. While playing in London, he was befriended by jazz legend, Chris Barber, who also had an active interest in motorsport. Slim bought from Chris an old Lotus 22 and shipped it back to Sweden where he began to campaign very successfully in Club Championships. He continued to play in a number of active groups including "Solar Plexus, which still retains something of a cult status to this day, and played session music with a number of different groups and artists including Alexis Corner, Teddy Wilson, Cornelius Wreswiijk, Monica Zetterlund, Thad Jones and Mel Lewis, even the Danish Philharmonic Orchestra and, of course, ABBA. Slim has a very extensive racing pedigree that is impossible to do it justice in any brief summary. He has competed at the highest levels in single-seater, sportscar, touring car and truckracing series.His race statistics between 1968 and 2009 are outstanding with 125 wins,119 other podium finishes and 68 fastest laps, from a total of 379 races. 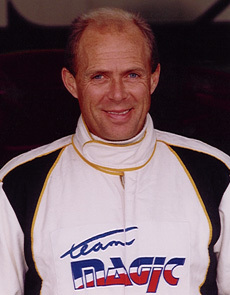 Amongst other highlights he won the Scandinavian Cup Formula Ford Championship, Swedish Formula3 and the European Formula3 Toyota Cup Championships, secured third in the FIA European Formula3, was FIA Nordic Cup Touring Car Champion, drove for ATS and Tyrell in Formula1(1981-82), won the special 25 Hour Willhire Race at Snetterton and was four times FIA European Truck Racing Champion.